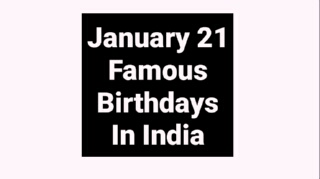 In this post you will know -- Famous Birthdays January 21 Bollywood Actor Actress Cricket Politics, check who are sharing your birthday in India -- 21 January's famous birthday personality in India like Bollywood actor, actress, cricketer, politician and all famous Indian celebrity. January 21 famous birthdays in India. Sushant Singh Rajput(born on January 21, 1986 in Delhi, India) is an Indian television actor best known for playing the role of Preet in Kis Desh Mein Hai Meraa Dil and Manav in Pavitra Rishta and also known for his dancing skills post Zara Nachke Dikha and Jhalak Dikhhla Jaa. Sushant, a Delhi-ite, was born to the Rajput family. He defied his parents to follow his dreams. Santhanam is a Tamil film actor, who plays comedy roles in Tamil films. His fame started off in the Lollu Sabha. He made his feature film debut in Manmadhan in 2004 and later appeared in several successful films. He is best known for his roles in Siruthai (2011) and director M. Rajesh's comic trilogy, comprising Siva Manasula Sakthi (2009), Boss Engira Bhaskaran (2010) and Oru Kal Oru Kannadi. Kim Michelle Sharma (born 21 January 1980) is a Bollywood actress and model. Kim was born in Ahmednagar to an Indian father and a Japanese mother. She has 3 sisters. Kim did her schooling at St. Joseph's Convent in Panchgani. She then returned to her hometown and joined a junior college. Of her college days, she said 'Having studied in a boarding school. Sundar C. is a Tamil film director and actor. He has directed 25 films in Kollywood and debuted his acting career in 2006 with the film Thalai Nagaram. Initially he worked as a assistant director to Manivannan and he got introduced as a director from the movie Murai Maman. Which is family drama. He got success as a director because of his comedy sense. Vaikom Muhammad Basheer (21 January 1908 – 5 July 1994) was a Malayalam fiction writer from the state of Kerala in India. He was a humanist, freedom fighter, novelist and short story writer. He is noted for his pathbreaking, disarmingly down-to-earth style of writing that made him equally popular among literary critics as well as the common man. He is regarded as one of the most successful. Auto Shankar (January 21, 1954 – April 27, 1995) is the nickname of an Indian serial killer. Shankar and his gang were found guilty of six murders, committed over a period of two years in 1988–1989. They were tried for the murders of Lalitha, Sudalai, Sampath, Mohan, Govindaraj and Ravi. The bodies of the victims were either burnt or buried inside residential houses. Rubina Ali (born January 21, 1999), also known as Rubina Qureshi, is an Indian child actress who played the child version of Latika in the Oscar-winning film Slumdog Millionaire (2008), for which she won a Screen Actors Guild Award. Following the film's success, she was cast in the Bollywood film Kal Kisne Dekha (2009). Rubina's casting in Slumdog Millionaire. Madhu Dandavate (21 January 1924 – 12 November 2005) was an Indian politician. He was born in a Deshastha family. He was popularly known as an Economist. During 1970-71 he was member of Maharashtra Legislative Council. From 1971 to 1990 he was an M.P., elected to the Lok Sabha for 5 times consecutively from Rajapur in Konkan, Maharashtra. Govindan Aravindan (born 21 January 1935 in Kottayam — died 15 March 1991 in Trivandrum) who was popularly known as G. Aravindan was a national award winning film director, screenwriter, musician and cartoonist from Kerala, India. He was known for his unorthodox way of film-making. Naga Vaishnavi (January 21, 2000 – February 2, 2010) was the daughter of Palagani Prabhakara Rao, a noted businessman in Andhra Pradesh, and his second wife Narmada. Vaishnavi was kidnapped on January 30, 2010, and murdered by her kidnappers on February 2 of that same year. That incident caused tremendous shock for her father, resulting in cardiac arrest and death. Manchanahalli Rangaswamy Satyanarayana Rao known by the abbreviation M. R. S. Rao, is an Indian scientist, born on 21 January 1948 at Mysore, India. He has been awarded Padma Shri in Science and Engineering category (year 2010) by the Government of India. He is the President of Jawaharlal Nehru Centre for Advanced Scientific Research (JNCASR), Bangalore, India. Saurabh Narain Singh (born 21 January 1975) is a member of the 3rd Vidhan Sabha of Jharkhand representing the Indian National Congress. He is also the current titular Raja Bahadur of Ramgarh. Saurabh Narain Singh was born in New Delhi, India to Raja Bahadur Indra Jitendra Narain Singh and Rani Rewa Singh. He has studied at The Modern School, The Doon School, University of Delhi. Dasari Prasada Rao (born 21 January 1950) is an Indian Cardiothoracic surgeon. He was noteworthy for introducing the first open heart surgery to the state of Andhra Pradesh in India and for pioneering advanced medical care at affordable costs. Dasari Prasada Rao has won numerous awards including in 2001 the Padma Shri award, a Civilian award bestowed by the Government of India. Mar Abraham Kattumana (21 January 1944 – 4 April 1995) was a Syro Malabar Catholic Archbishop. He was the Pontifical Delegate to the Archdiocese of Ernakulam-Angamaly. Previously, he had served as Pro nuncio to Ghana, Benin, and Togo. During his tenure as Pontifical Delegate to the Syro Malabar Catholic Church, the powers of Major Archbishop were vested in him. Agnelo Gustavo Adolfo de Souza (21 January 1869 – 20 November 1927) was a Roman Catholic priest of the Society of Missionaries of St. Francis Xavier who performed missionary work in Goa, India. Padr Agnel, as he is known, was born in his native village of Anjuna to Minguel Arcanjo de Souza and Maria Sinforosa Perpetua Magalhães and died in Rachol. T. Visvanatha Pillai Kamalaswamy (January 21, 1911 – March 25, 1998) is an Indian politician from the Indian National Congress. Kadharsha was born on October 6, 1935 to T. S. Visvanatha Pillai. He served as a member of the Rajya Sabha from April 3, 1952 to April 2, 1954 and April 3, 1954 to April 2, 1960. Richard James Mansfield (born 21 January 1975) is a former Indian born English cricketer. Mansfield was a right-handed batsman who bowled right-arm off break. He was born in Madras, Tamil Nadu. Mansfield represented the Surrey Cricket Board in 3 List A matches, the first of which came against Lincolnshire in the 2nd round of the 2002 Cheltenham & Gloucester Trophy which was played in 2001. Lieutenant Colonel Jaswant Singh Marwah (born 21 January 1921) is an Indian journalist and author, and the father of General Joginder Jaswant Singh, the first Sikh Chief of Army Staff of the Indian Army. He was a former Special Duty Officer in the Archaeological Survey of India, and served in the Indian Army's Electrical Mechanical Engineering branch from 1943 to 1973.